Des Moines, Iowa (CNN) Hillary Clinton pledged Sunday that as president she would put the United States on a path toward generating enough renewable energy to power every home in the country by 2027 – ten years after she would hypothetically take office. In a video posted to her campaign website, Clinton knocked Republicans for refusing “to accept the settled science of climate change” and cast her push as a fight for children and grandchildren. The video – titled “Stand for Reality” – featured a slate of quotes from Republicans on climate change, including when former Florida Gov. Jeb Bush told Esquire Magazine in 2009, “I’m a skeptic. I’m not a scientist.” The slate also included quotes from Sens. Marco Rubio, Ted Cruz and Rand Paul. 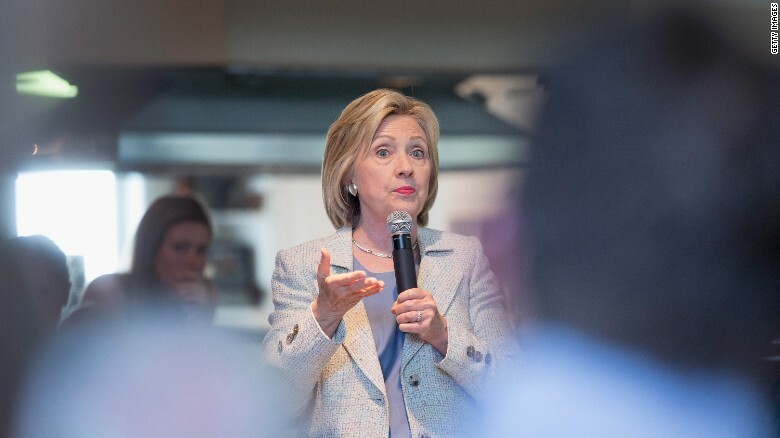 Clinton’s plan focuses largely on residential power usage and is buoyed by a focus on solar. By the end of her hypothetical first term as president, Clinton promised that the United States would have more than 500 million solar panels installed across the country. The presidential candidate also stressed building an energy grid more focused on renewable energy, particularly solar, by the end of the decade. According to a fact sheet circulated by Clinton’s campaign, a Clinton presidency would hope to increase output of solar energy by 700% by the end of the decade. On Monday, Clinton will expand on her clean energy push in Iowa when she tours that LEED Platinum certified Des Moines Area Regional Transit (DART) Central Station. Clinton’s said he plan would incentivize investment in renewables by increasing the number of government grants for clean energy, extending federal clean energy tax incentives and expanding renewable energy on public lands. The former secretary of state’s clean energy pitch comes at a time where many Democrats are focused on climate change, particularly the need to decrease the use of fossil fuels. According to the World Bank, over 85% of U.S. energy consumption came from fossil fuels. Clinton was confronted by climate change protestors at a town hall earlier this month in New Hampshire. The former secretary of state was first asked a “yes or no” question about banning the extraction of fossil fuels from public grounds. Clinton did not give the protestors the answer they wanted, telling them she would not ban the practice until alternatives were in place. Some of Clinton’s top supporters have also been outspoken on the need for 2016 Democrats to tackle climate change. “Whether or not candidates make this commitment will be a critical factor for Americans who are deciding what candidates to support at polls,” wrote Steyer, who has already hosted a fundraiser for Clinton at his home in California. An aide to Steyer tells CNN that Clinton’s energy proposal meets the standard the environmentalist outlined last week. Clinton’s campaign claimed Sunday that their plan matches the Steyer pledge, but a supportive statement from the environmentalist did not outright say Clinton’s plan met his standards. He did call the plan “an ambitious framework to put our nation on a path to a clean energy economy,” adding that Clinton “emerged as a strong leader in solving the climate crisis and ensuring our country’s economic security” due to the proposal. But other 2016 Democrats were quick to pounce on Clinton’s proposal. “Eschewing the piecemeal, poll-tested ‘all of the above’ energy strategies of the past, O’Malley has made clear that he will use the full force of his executive power to make the transition to a clean energy future the number one priority of our federal government,” Smith wrote. Despite the critics, Clinton’s plans was met with warm regard from environmental groups.